Last week I hit a point where my hair just felt gross. No matter what I did to it, I couldn't shake that feeling you get when you haven't washed your hair. As I sat at work feeling like I just wanted to go home and dunk my head in the shower I remembered that Zoe had posted about this same problem a while back. I quickly pulled up that post and saw her recommendation - a clarifying shampoo to rid your hair of product build up. 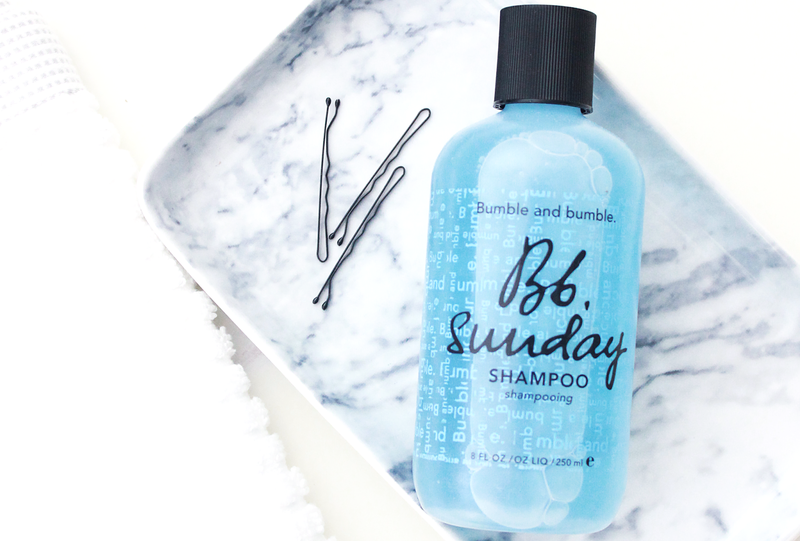 I began doing some research and eventually settled on Bumble & Bumble's Sunday Shampoo. After work last Tuesday I immediately ran over to Blue Mercury and grabbed a bottle. This shampoo is a total game changer. I washed my hair twice that night. An initial washing and then a second, more intense wash. After the initial wash I could tell that the shampoo had taken out a layer of built up product and was cleansing my hair differently. I spent extra time lathering up and allowed the shampoo to sink in for a few minutes. Once I washed all the product out of my hair I could instantly tell a difference. As my hair dried it just felt nicer, it was also shinier and sleeker. No more grease, no more weight. I had a coworker comment on my hair the next morning - telling me how fantastic it looked. I am converted. Have any of you used clarifying shampoos? If so, which is your favorite? I try to use a clarifying shampoo twice a month, I'm currently using the Fekkai Apple Cider Shampoo and I quite like it. I try not to over use it cause it does wash off my hair color if I do. I hate that feeling too! I haven't tried this shampoo but if it can save me some neurotic worrying I am all for it! I've heard so many talking about this, I think it's about time I picked it up for myself! I love using the Philip Kingsley No Scent/No Colour shampoo for the same reason, it's so gentle but manages to remove any build up with ease. Essential for those like me that have oilier hair with an unhealthy addiction to products! Love B+B hair products! I'm having that same weighed-down feeling so I'm thinking a good cut and shampoo is just what I need. I might just need to give this stuff a try! I was also thinking today that I need more texture in the ends of my hair, and that a good sea salt spray may be in order for the summer. I may just need a B&B haul! I've heard so many good things about this shampoo - now I definitely need it! I know, I always hate seeing the price point! But I figure with something like this I only use it once a week so at least it will last me quite a bit! Yes! It's so, so good!! I've heard quite a few things about Lush's bar shampoos recently! (Especially that they are great for flying since you don't have to worry about carrying a liquid.) I'll have to check them out the next time I'm in there. Their Invisible Oil line is also great - gives some nice texture and all as well. As for texturizing sprays Oribe & Dry Bar both make great options! The Dry Bar Triple Sec is one Ashlyn got me to try and Sephora sells mini bottles of them. It could be great to get one little Dry Bar and one little B&B Sea Salt Spray to test out! B&B is definitely a favorite of mine! I also love their Invisible Oil line for regular washes. Isn't it such a frustrating feeling?! My hair just felt so weighed down and gross! I have a cut coming up in a few weeks and I can't wait! It always feels so good to have everything cleaned up! I've never heard of that one! I'll have to see if I can get it easily in the U.S., it sounds like it could be a great one to try after the B&B. It definitely was well worth the splurge price tag! I actually look forward to using this each week now! It's the worst feeling! All day at work I felt so self conscious of my hair - I'm sure no one else paid any attention to it though lol. Ooh I bet that one smells amazing! That is my one worry with using clarifying shampoo - at least with my color it's ombre, so it's meant to get lighter. Right now I'm sticking to a once a week wash unless I notice so major color changing.